Editor’s Note: This post was originally published on December 27, 2015 and has been updated for freshness, accuracy, and comprehensiveness. According to popular belief, how you spend New Year’s Day will dictate how you’re going to spend the next year. We say, hedge your bets and make sure that you’re not only skiing on New Year’s Day, but you’re also ringing in 2017 ski-town style. Ski towns know how to throw a party, and New Year’s Eve is no exception. From torchlight parades to pyrotechnical displays to concerts and parties so good you might not remember them in the morning, there’s no better place to say goodbye to 2016 than in a snow-covered town. Check out these ski towns for New Year’s Eve and say hello to 2017 in style. There is no doubt that Breckenridge knows how to celebrate (January’s Ullr Fest is a perfect example) and New Year’s Eve is no exception. Take the kids to participate in the glowworm parade, then enjoy the grown-up torchlight version on the mountain. For the best views of the town’s fireworks, head to Boreas Pass via snowshoes, skis or skins. To continue the festivities, head to town. The bars and restaurants along Main and Ridge streets put on their party shoes and allow guests to celebrate in style, from refined cuisine at Relish to the corner of crazy with Cecelia’s, Liquid Lounge and Brooklyn’s. Whistler is making New Year’s Eve family friendly with two venues, each with guaranteed “regret free” entertainment. Start with ice skating at Whistler Olympic Plaza, then move on to Teen Dance Party at the Whistler Conference Center. However, the main attraction (and it’s free for everyone!) is the Fire & Ice Show at Skiers Plaza. You’ll get to watch skiers and snowboarders throw down with fire. Jumping through flaming hoops. Then fireworks. It’s New Year’s Eve with a bang. 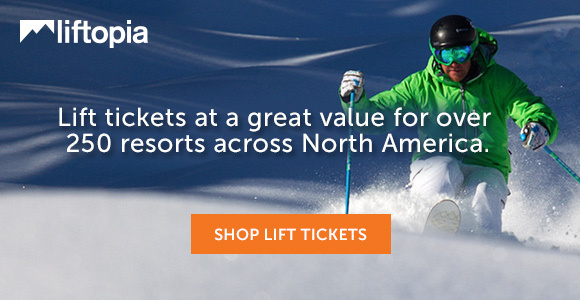 See Western Canada lift tickets. Named one of the top 25 ski towns in the world, North Conway, NH is already on the map. However, it’s also a stellar pick for New Year’s Eve festivities. Spend the day skiing or riding at any of the 13 ski resorts and XC Centers in Mt Washington Valley, then hop on the Conway Scenic Railroad for a holiday train ride. A special “Cranapalooza” celebration at Cranmore Ski Resort kicks off the official NYE festivities, with plenty of family friendly elements and not one, but two massive fireworks displays: one at Cranmore and one in Schouler Park in North Conway. See New England lift tickets. Home to some of the biggest skiing in North America (just recently eclipsed by Park City), Big Sky goes big in just about everything—New Year’s Eve, too. No matter your age, there’s a party to celebrate: a separate one for kids (a climbing wall and bungee jump! ), one for teens (pizza!) and one for adults (live music!). Factor in two fireworks shows, at 8 p.m. and midnight, and Big Sky is going to mean Big Fun for the New Year. See Northern Rockies lift tickets. What’s better than watching skiers meander down the mountain during a torchlight parade on New Year’s Eve? Getting in a few turns yourself. Head to Sun Valley for New Year’s Eve and you can enjoy night skiing at Dollar Mountain from 5 p.m. – 9 p.m. plus music and tasty treats. After conquering the mountain, head to the annual Bubbly Bash and dance the night away. It’s a town with history. It’s the place where Wild Bill Hickok met his maker holding aces and eights—known ever after as the Dead Man’s Hand. However, you don’t have to gamble on a good time in this Black Hills town. Located seven miles from Deer Mountain Ski Resort and not quite 10 miles from Terry Peak Ski Area, Deadwood is ringing in the New Year with a balloon drop at the Deadwood Mountain Grand; a ball drop on Main Street and plenty of parties throughout Deadwood. Take the Trolley (only $1 per ride) and you can leave the winter gear in the hotel. “And the weather gods smiled upon the west coast of the United States and blessed them with El Nino…and the resorts in Lake Tahoe celebrated.” You’ll have your pick of parties in Lake Tahoe this New Year’s Eve, with bashes big and small in both north and south Lake Tahoe. On the North Shore: head to the Crystal Bay Casino for live music and dance parties; Northstar-at-Tahoe has fireworks, a David Bowie tribute band and Polynesian dancers; Squaw Valley is hosting a ginormous party at the newly renovated Olympic House with bands, DJs and five (count them, five) bars for exceptional lubrication. On the South Shore, Heavenly Resort is hosting fire dancers, ice carvers and a Gondola Ball Drop at midnight. For music lovers, a little party called the SnowGlobe Music Festival is going on too: three days of live music (more than 50 acts) on multiple stages, culminating on New Year’s Eve. You can party with thousands before hitting the slopes on New Year’s Day. While you can party down in town at the Silver Dollar Saloon or another historic bar in Jackson, consider a higher calling this New Year’s Eve at Jackson Hole Resort. While the torchlight parade and fireworks start around 6 p.m., the party really starts when you hop in the gondola and glide to almost 10,000 feet. The Gondi-Gala at Couloir Restaurant, which is located at the top of the Bridger Gondola, allows guests to rock in the New Year with live music and a complimentary champagne toast. Celebrate southwest Colorado style in Durango, where more than five feet of snow has fallen at Purgatory resort so far this year. While the resort is celebrating with a torchlight parade, the town of Durango will have live music and horse-drawn sleigh rides. If you save some energy, you can start your year on the D&SNG steam-powered train with a New Year’s Day brunch. While its fame doesn’t necessarily stem from its ski resort, Ski Santa Fe has received quite a bit of snow—enough to make you say Prospero Año Nuevo this New Year’s Eve this year. Head to the Plaza to warm up with luminarias (piñon bonfires) and enjoy hot chocolate and food truck fare. Live music will get you dancing and a surprise is promised for midnight. There are many ways to ring in the New Year, from sophisticated dinners with friends to solo skins in the snow to rowdy throw-downs with a few hundred of your new buds. No matter how you choose to celebrate, just remember that tomorrow is the first day of the rest of your season—get out there and enjoy. South Lake has some great parties, and the snowglobe festival is awesome!